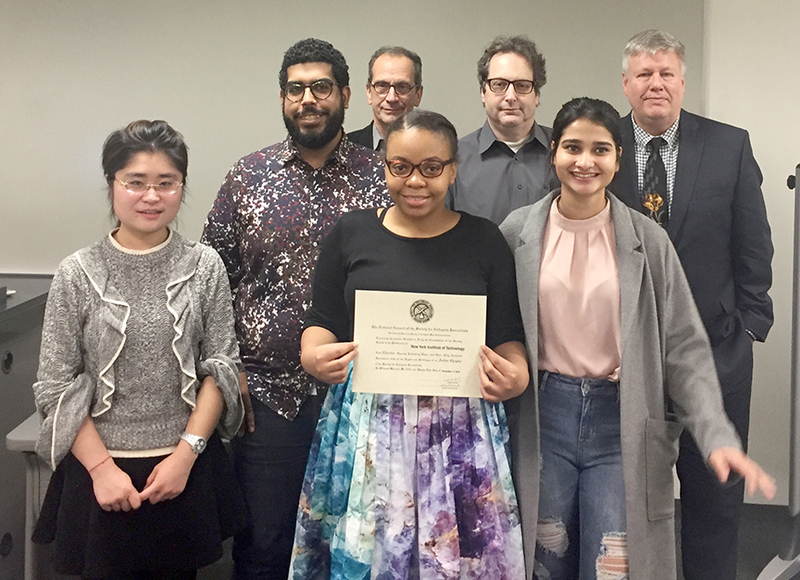 Congrats to the New York Institute of Technology for recently establishing a new chapter and inducting its founding members! The occasion also marked the establishment of the NYIT chapter of the Society of College Journalists. Among the Globe staff SCJ chapter inductees in the front row: SCJ chapter presiding officer Medgeen “Medge” Ross (holding certificate), who’s flanked by Globe co-editor Nicole Pereira on the right and reporter Qian Zhang on the left. The second row left to right: Globe copy editor Eric Fantauzzi; professor Don Fizznoglia, Comm. Arts chair; Globe adviser professor Larry Jaffee; and James Simon, dean of NYIT’s College of Arts & Sciences.